If you are thinking about how to make watermelon juice that is significantly nutritious and delicious, then you need to consider my preferred three options. Watermelon is substantially hydrating and contains vitamin A, vitamin B, and vitamin C.
Eating watermelon improves your health and prevents diseases such as cancer. The presence of lycopene in watermelon which is an antioxidant that helps fight cancer makes watermelon one of the fruits you will need to regularly stock and eat. Watermelon is a versatile fruit which can be used in salad with the other fruit and vegetable like carrot, cabbage, cucumber, apple...,for detox tea, and of course, for juice. Having made watermelon juice for two decades straight-on as a staple piece in our meals, I can assure you that my recipe is proven and well-reviewed. You will find the optional recipes easy to follow and adopt. Many researchers in the world have experimented on this research. It has been found that the presence of lycopene in watermelons is of multiple health benefits especially for the prevention of the deadly disease cancer. Eating watermelons and drinking its juice will help in better blood flow which in turn ensures an improved cardiovascular system. The presence of citrulline in watermelon helps in enhancing better blood flow. Eating watermelon helps in ensuring that diseases associated with the kidney will be prevented. These diseases including kidney stones will have minimal chances of perturbing people who are regular consumers of watermelon and its juice. If there is any fruit that will genuinely help add minerals and vitamins A, B and C to your body, it is the watermelon. The supply of vitamins comes across as imperative for your physiology, and you should not take it for granted. You will need to take a cup of watermelon juice probably daily to help you get the required nutrients in your body. Being overweight comes with its red flags. Especially for ladies who tend to gain weight with ease, taking a cup of watermelon juice maybe daily will help alleviate this abnormality. These are some of the benefits of taking watermelons juice every day. The health benefits of this fruit cannot be taken for granted. We are now going to have a view on how you could prepare the healthy watermelon juice with ease. Watermelon Juice is commonly found in the refrigerated area of markets under numerous brands. Before buying, make sure to look at the dates affixed to it so as to be sure you are on the safe side. Affirming the best –use date is important to get the desired freshness. Be that as it may, it's less demanding and much more advantageous when made at home as it is free from additives and sugar. You can make watermelon juice at home with your personal pick of additives. Blending watermelon juice requires that you have a blender. There are different procedures you could use to help extract watermelon juice. Get ready your watermelon for squeezing. If you have a sweet palate, select a sweeter assortment of watermelon, for example, the infant sugar variety. New mint makes a taste leap to watermelon juice. Include a couple of clean mint leaves to the juice as you start mixing. Leave the white skin in place; it contains a larger number of vitamins and supplements than the red tissue. On the score that you can't locate a seedless watermelon, cut a normal watermelon into quarters. Discover the seed line and cut along the line with a paring blade. Extricate the piece that you slice and utilize a fork to take out any outstanding seeds that are still joined to the watermelon. Recipe 1: Blending the Juice with Honey. This recipe will show you how to prepare watermelon juice to become sweeter. The method used during this process is to add honey to the watermelonprior to blending the juice. Let’s have a look at how you could easily blend you juice using honey. You will need to peel the watermelon on a cutting board. Ensure you chop the watermelon into small pieces. ​You will need to put the watermelon pieces into a bowl. ​Continue to add honey or apply honey into the watermelon pieces in the bowl. ​You will be required to blend the watermelon pieces using a blender. ​Then add water and ice cubes to ensure thinner juice and thicker juice respectively. ​Continue blending the juice to make it even smoother. ​If you would like to remove the pulp from the juice, ensure that you strain the mix carefully. Then add the juice into a glass. The juice is now ready to serve. If you desire to prepare your sweet watermelon juice, then you will need to follow the procedure and use the ingredients above. These are just a few; easy to follow procedures that will help you prepare sweet watermelon juice. If you love to prepare watermelon juice using hot lemon then here is your step board.The recipe listed below is a pretty simple procedure that produces tasty watermelon juice you could really long to drink. Let’s have a look at the process you will need to follow in how to make watermelon juice. Start by slicing the watermelons into small pieces and put the chopped pieces into a bowl. ​Then blend the watermelons and the lemon- juice until you get the smoothness desirable. ​Then add sugar into the watermelon mixture. ​Ensure that you mix the juice with sugar. ​Continue to heat the mixture in a saucepan and make sure it doesn’t boil. ​Remove the juice from the heat and let it cool. ​Pour the juice into a jar or glass. The procedure and the ingredients outlined are based on a simple a step by step methodology of preparing watermelon juice with hot lemons. Following the procedure will help you create this amazing watermelon juice you will love. We are now preparing watermelon juice using pomegranate. Using this ingredient in the incorporation is another method you could use to prepare your watermelon juice with great taste. The ingredients and procedure for preparing this kind of juice is easy to follow. You will achieve incredible results when you follow the procedure keenly. 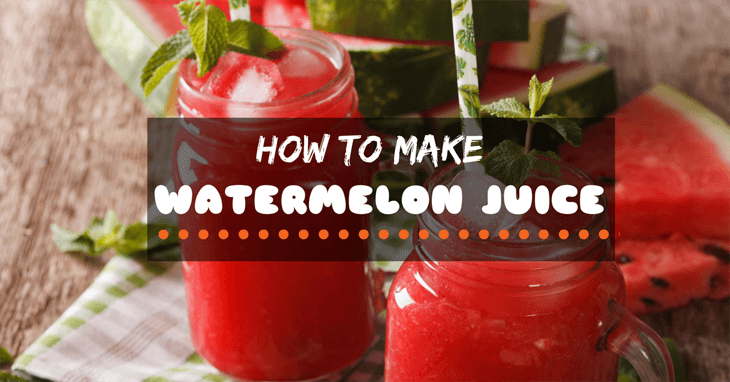 Let’s have a look at the procedure you will need to follow to prepare this alternate watermelon juice preparation method. Properly ensure that you peel your seedless watermelons and then chop the watermelons into tiny pieces. ​You will then ensure that you have all seeds removed from the pomegranate. ​Put aside a few seeds to help you prepare the garnish afterward. ​Then add the seedless watermelons into a blending machine for blending. ​Insert the raspberries into the blender or juicer. ​Ensure that you add the pomegranate seeds into the blender. ​Now it is time to start blending to ensure that the mixture is incredibly smooth. ​Then add the ice cubes or the cool water into a glass. ​Add the juice you have prepared into a glass. ​Place the seeds of the pomegranate and ensure they float on the blended juice to make sure that it garnish. By now you can share your watermelons juice with pomegranate with your friends. You will like the flavored taste that it presents. When you complete the preparation process, you need to keep your watermelon juice refrigerated to best safeguard its freshness, flavor, and deliciousness. Try not to keep it for over 24 hours in order not to ruin the taste or make it unpalatable. One of an ideal route is to solidify pureed watermelon in your iced shape plate. We have gone through 3 simple procedures that could help you prepare the watermelons juice with pomegranate, watermelons juice with hot lemon and also watermelons juice with honey. In learning how to make watermelon juice in these ways, you will see a significant change when it comes to improving your health. Now that we have prepared our sweet watermelon juice it’s time to sit down and enjoy taking your watermelons juice. I hope you will enjoy making this juice and share the freshness of this juice with you friends.